Mural decoration in Art Deco style mosaic. Venitian smalts mosaic artwork. 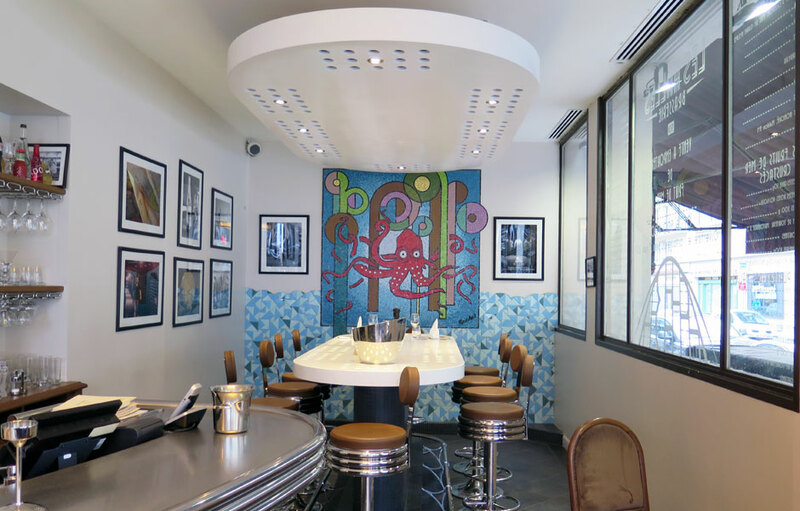 Art deco style mosaic artwork: a creation of an artistic mural in mosaic for the decor of a ‘Seafood’ desk in a 1930’s restaurant, located in the Art Deco area of Reims (France). 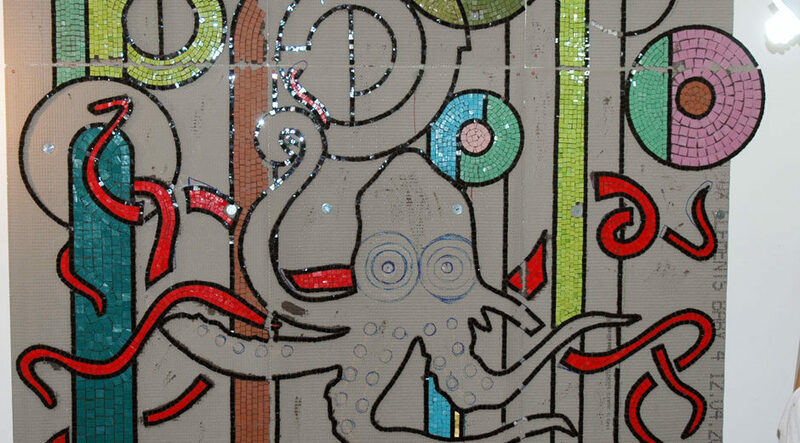 Realisation with Venetian smalti mosaic on panels. Installed in situ by the mosaic studio in collaboration with the sculptor J.Michel Labarre. 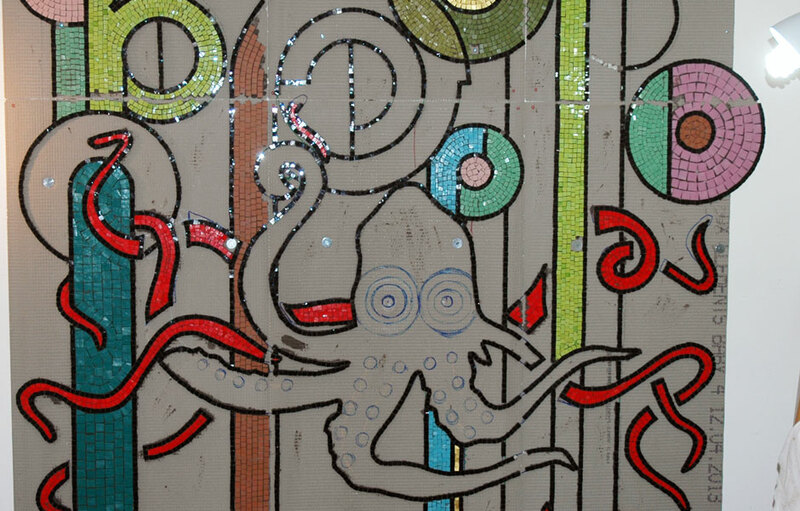 This mosaic artwork was made on the occasion of the new decoration of a seafood countertop in a famous restaurant from the 1930s, in Reims: Brasserie des halles. A smalts and ceramic tiles mosaic in the Art Deco style of Isidore Odorico. Isidore Odorico was one of the most famous mosaic artists in the Art Deco period and he left a wonderful and large heritage of architectural mosaics ornamentations in France. Learn more on that 1930s mosaic artist. 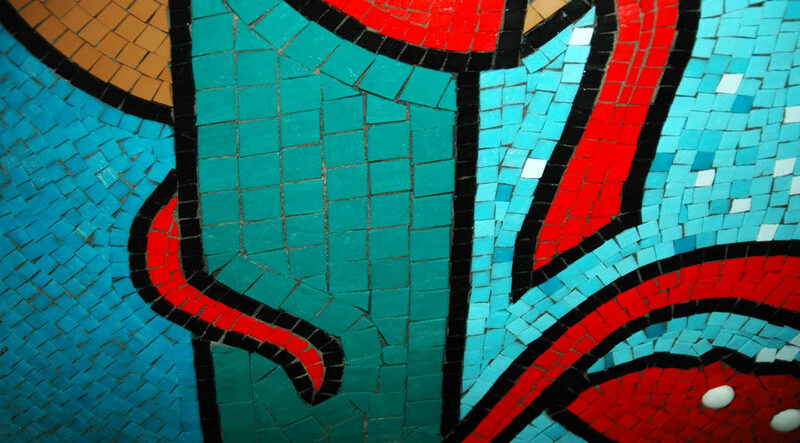 An exhuberant and colourful mosaic as a recall to the Art Deco period! This artwork was made for one of the most popular and old brasseries of Reims, built in the early 1930’s. Newly redecorated, it is established right in the heart of the Art Deco area of Reims, facing the covered market ‘le Boulingrin‘. 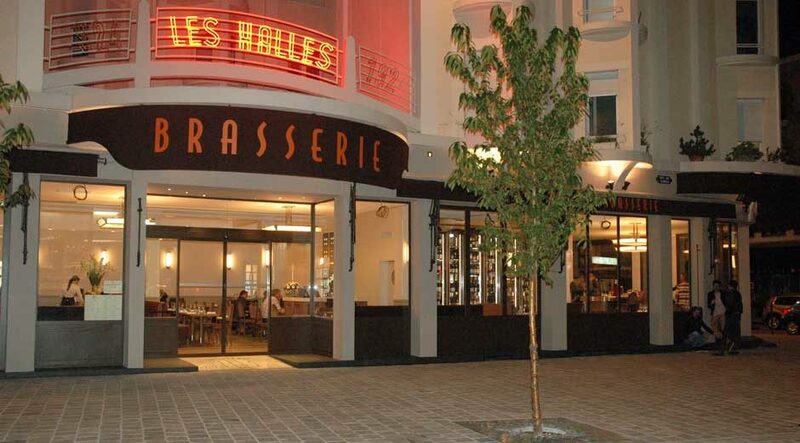 The brasserie Les Halles, built in 1924, has just re-opened its doors. 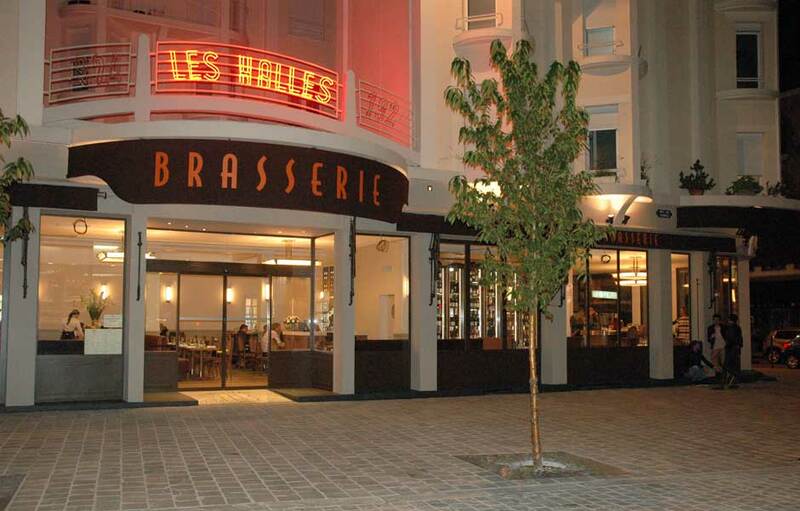 The owner who is passionate about the rich historical heritage of his town and, in particular, the highly decorative Art Deco patterns punctuating his area, decided to create a recall to the Art Deco period in his, nonetheless, modern brasserie. 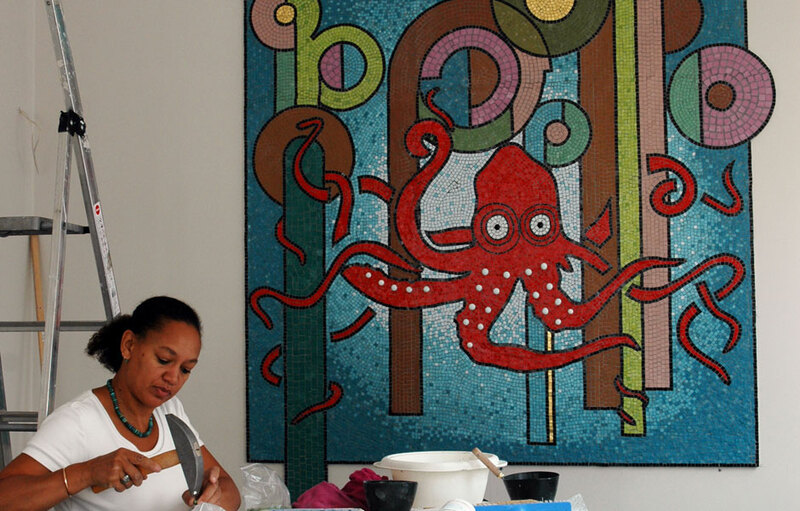 This evocative 3 m2 mosaic wall decoration, made in August 2013, at the studio Stuc & Mosaic, has totted up about 120 hours of a meticulous work, with a hammer and hardie cut (professionnal tools of mosaic artists). 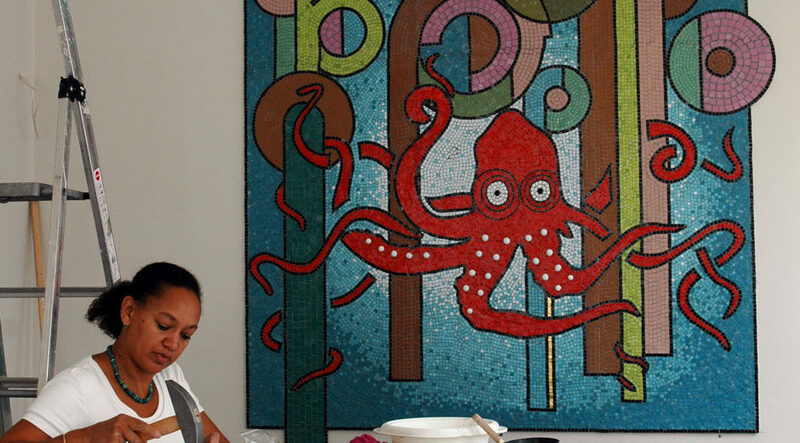 The mosaic is intended to create a unique atmosphere in the seafood dining area of the restaurant. A recall to Isidore Odorico’s work of art: the owner’s choice was to recall the remarkable artwork of Isidore Odorico, the mosaic artist symbol of the Art-Deco style mosaic. The above decoration is inspired from a commercial sign created by Isidore Odorico for the company Perrier-Baron (fruits wholesaler). This italian mosaic artist decorated numerous commercial and professional establishments with an Art Deco style and his family firm became one of the most important workshop in France in the 30’s, employing about a hundred of workers. Preliminary sketch: ‘Carte blanche’ for the pattern with the use of the 30’s mosaic decorative technique, which includes a choice of a distinctive mix of materials added to the uncluttered and geometrical lines. Materials and colours! The materials are carefully chosen (a mix of shiny smalts cut in different size and stoneware mosaic tiles) to give a sparkling render. The hand-crafted smalts accentuate the artistic and irregular effect. 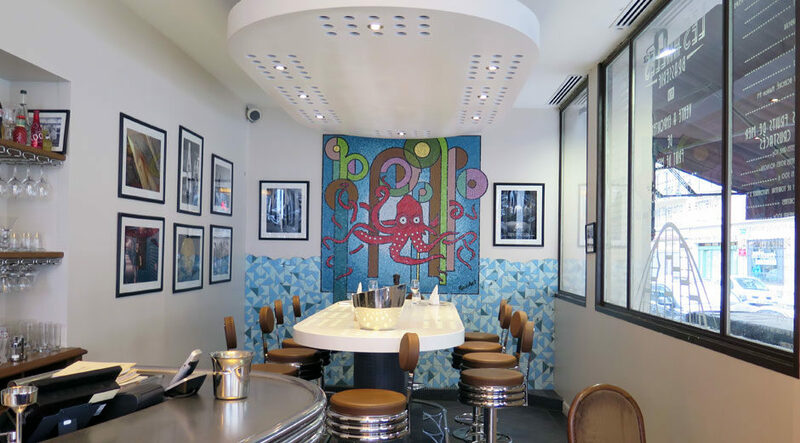 Art Deco mosaic artwork can be part of the most refined decors in so many various places and It is also of special importance to the rehabilitation or promotion of an historical heritage building (see this other mosaic artwork for this 1900s brasserie). 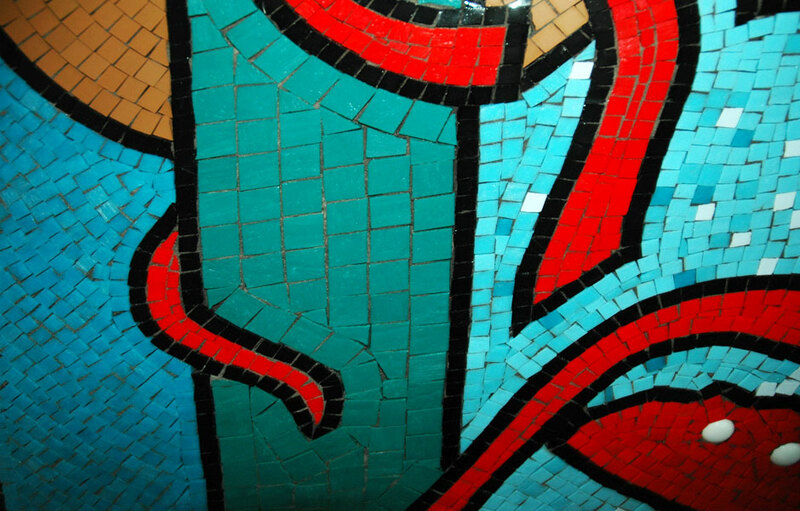 Where does the art deco mosaic originates from? The expression ‘Art Deco’ originates from the ‘Exposition Internationale des Arts Decoratifs Industriels et Modernes’ held in Paris, in 1925. This exhibition was organized by a group of French artists known as the society of decorator artists. Art Deco became the most trendy international style in Modern Art from 1925 till the 1940s. The Art Deco style which, in a first place, reflected the modern technology, distinguished itself by applying fluid lines, geometric patterns, modernized forms and bright and even flashy colours. Originally a luxury style (in reaction against the austerity forced upon by the World War I), it employed expensive materials such as silver, crystal, ivory, jade or lacquer. after the 1929 Depression it also adopted cheaper and industrial materials like chrome, plastics, and other mass-produced items serving the growing middle class taste for a modern style that was not only refined and glamorous but also functional. 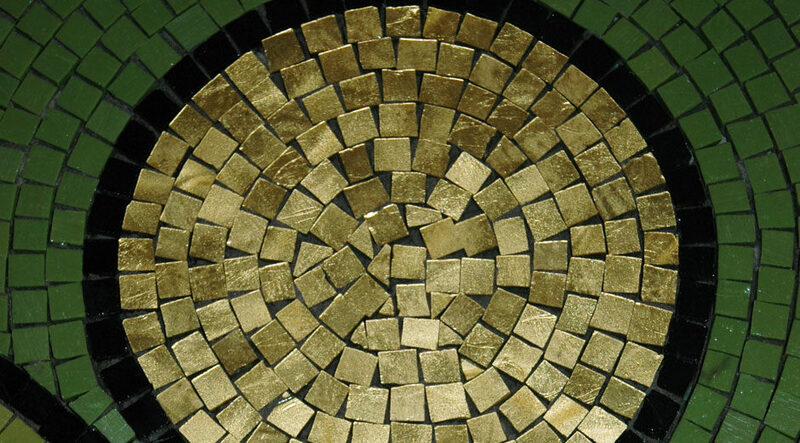 Are you looking for an Art Deco style mosaic or Art Nouveau style mosaic? As a mosaic artist, I would be delighted to study your project, whether you wish to highlight a private property dating from the 1900’s period with Art deco style mosaics, or Art Nouveau mosaics. Do no hesitate in contacting me for a quotation! 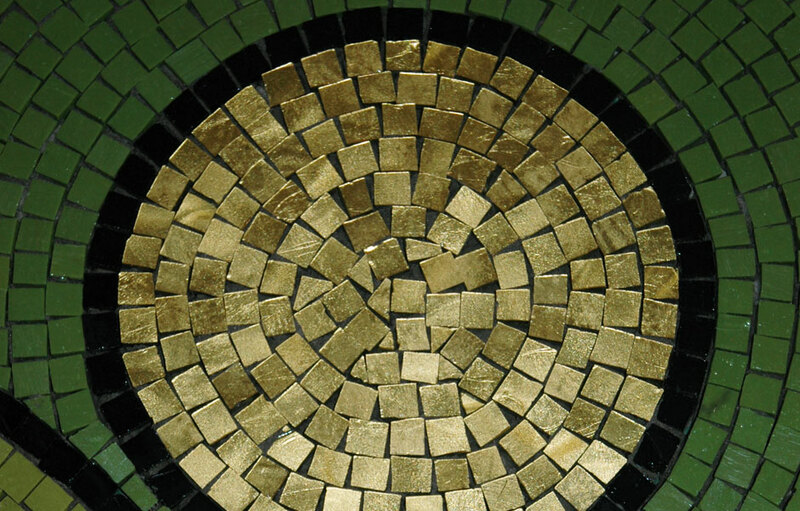 Any type of art deco mosaics may be created: mosaics for the bathroom, flooring mosaic tiles for a doorstep, an art deco emblema with the name of the villa, initials in mosaic, an outdoor or indoor mosaic mural, a residence hall customisation, lettering in art-deco mosaics, art deco mosaic patterns on a swimming pool or a fountain ornamented with mosaics…etc. I can also create for you a decorative furniture: for example an outdoor table with a custom-made mosaic pattern, matching the colours of a stylish appartment, or an outdoor decorative bench. A mosaic decor referring to the Art Deco style may be considered as a complementary architecture ‘plus value’ to an initially modest decoration from that period or to an estate which would necessitate a renovation.